Casa Las Palmas is your perfect tropical Mexican get away. In this coconut palm grove with beautiful manicured gardens, common area pool and active sea turtle sanctuary, is our home away from home. 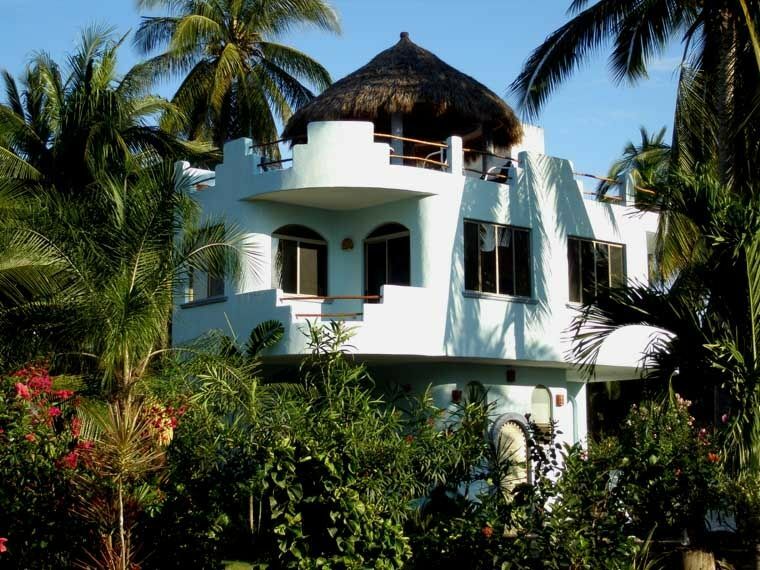 Casa Las Palmas is one of 10 beautiful Villas for rent at Playa las Tortugas. Our 'casa' with 2 bedrooms on the ground floor each with a full bath, walk in shower and individual beach access with outdoor shower will meet all your needs. A winding stairwell guides you to the second floor living/dining/kitchen area with 2 covered patios and 1/2 bath. The views of the beach and gardens are easily enjoyed from this level, while you are cooking in the open kitchen listening to music and visiting with family/guests. From the living area continue to the roof terrace with it's own thatched palapa to cook on our grill, sunbathe, play board games, read a book or just sit and listen to the crashing waves on the beach, watch the incredible sunsets, stare at the stars so brilliant you think you can touch them. The chairs and lounges are so comfortable, the breezes so pleasing and the views so incredible that you may not leave this inviting terrace other than to refill your drink or obtain a snack. From the main living level look down through the palms onto the warm blue water and sand of the Pacific Ocean. And, yes, the sunsets are frequently as spectacular as our unique setting. You have the opportunity to either enjoy the sunning and playing in the waves, or a swim in the fresh water pool at Playa Las Tortugas, with it’s palm-roofed palapa and comfortable sunning chairs, or just sit and relax with a cool drink. Need some shade? The tall coconut palms and palapa offer you a respite from the sun. Some of our guests say they hardly ever come down from the rooftop because it’s their very favorite place, in the world. Our entire state of Nayarit area enjoys one of the most favorable climates in the world. Average daily year-round temperatures range from highs of 80-85 degrees (perfect beach weather) to lows of 60-70 degrees(perfect sleeping weather). Swim year round, but consider packing a light sweater for the evenings in the winter months. Rain, when it falls, generally occurs between June and September as night-time or pre-dawn thundershowers. You can visit small typical Mexican villages, enjoy fresh fish and other local seafood at small rustic beachfront restaurants, tour a tropical river and waterfalls, see historic San Blas, and drive up through the foothills of the Sierra Madre mountains to colonial Tepic where crafts of the Huichol Indians are found. Playa Las Tortugas has kilometers of uncrowded, clean sand beach, and a number of activities both on property and nearby such as Surfing, Wave Kayaking, Boogie Boarding, Fishing, and Shelling, Canoeing, Whale Watching, Bird Watching, Walking or Running on Miles of Sand Beach, and Sea Turtle Conservation activities (during season) at the Sea Turtle Conservation Camp. Frequently there is one festival or another in small towns within an hour of our location. There are a number of excursions you might take, with or without a guide. Playa Las Tortugas is located on a section of coastline which is nesting habitat of several species of sea turtle in the beautiful state of Nayarit, Mexico 70 miles north of the Puerto Vallarta (PVR) International Airport and about 50 miles west of Tepic, the colonial capital of Nayarit. We are happy to arrange transportation for you in our private shuttle, you may rent a car and drive your self which a large number of our guests do, or if you'd like to be more adventurous you may decide to come by bus and local taxi. We can send you details on the numerous car rental companies, or instructions on which buses and local taxis to take. It’s quite easy to find your way from the Puerto Vallarta International Airport to Playa Las Tortugas, and the roads are normally well-maintained. Your valid driver's license is accepted in Mexico, and the driving rules are virtually the same as most countries. Write us for a copy of detailed driving instructions and a map. Your scenic drive north from the airport takes less than 2 hours and goes through areas of old-growth jungle and coastal hills. Visit us and enjoy a tropical vacation on miles of warm pristine sand beach! english, With internet translating, any language is fine. Villa las Palmas has all the amenities of home. Beautiful gardens, beautiful private beach with lots of shells to find. We even have the Km. markers to show how far you've walked. Just peaceful, quiet and lovely. You can walk for miles and have the beach to yourself. Colorful tiled full bathrooms attached to each bedroom. Half bath on main level. Good ocean views from second and third levels. A/C units in each bedroom. Ceiling fans throughout. All linens including beach towels provided. For maid's use only. Two loads of laundry weekly included in your rate. More loads available on request for nominal fee. wifi password provided at check in. Prepare your own meals or have our cook pamper you. boogie boards for your use. Available to rent through the Office. Activities Guide, Local Activities, Local Maps, Bottled Water, Canoes and kayaks available for nominal fee, Ceiling Fans, Cook available, Daily maid service, Dining Room Seating for 6, Gardens: Private and large common area gardens with hundreds of tropical plants, Housekeeper Included, Internet high speed wireless available for nominal fee, Lounge Seating for 6, Massage available (extra charge), Outdoor shower, Patio, Private Palm-Roofed Palapa, Large Tiled and Partially Covered Sunning Terrace, Pool: Large pool with palapa for the homes at Playa Las Tortugas, Private cook available (extra charge), Restaurant dining guide, Soap and Toilet Paper provided, Beach Towels provided, Walkway to Water, No Pets Allowed, Smoking Not Allowed: No smoking inside please! We rented the villa, Las Palmas, for a week with our two young adult children and one of their friends. We had wanted to get away from busy beaches and all-inclusives and this fully- furnished, tastefully decorated house steps away from a really nice pool with an expansive, empty beach just beyond, fit the bill. We bought groceries just outside of Puerta Vallarta, as there are no restaurants very close by, but had the staff cook for us two separate days. These meals were excellent. She was also able to do grocery shopping for us further into the week so we did not have to leave the property. The beach was amazing for boogie boarding and we were able to release newly hatched turtles into the ocean from the turtle sanctuary at one end of the beach. Furthermore, a mangrove lagoon at this same end made for some calm swimming, kayaking, and paddle-boarding. The staff in this community were accommodating at all times and very helpful. We always felt very safe. We will come back again soon.